That's pretty much me these days. and tapping away at the keyboard is pretty much all I manage. And...oh my gosh...where do the hours go when you're on Pinterest?! Or I Can Has Cheezburger (cute pet pics)? Speckled Egg's Altered Journal swap. I love them, thank you Ros and Kim!! 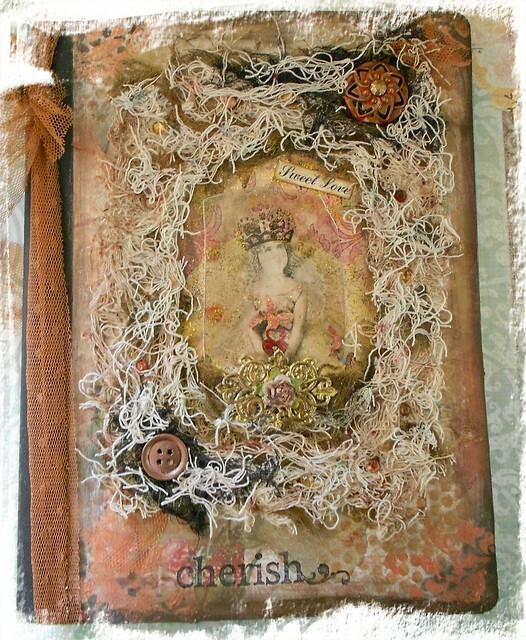 The journal pages you received are lovely as is the brooch you made. Lorraine: You have to get better soon so we can resume our weekly outings! I just love the journals and your brooch is so beautiful. I know that Melanie will really enjoy it. Hope you feel better. So many people are sick these days. Love the brooch. Thank you so much for the adorable images. Happy Pink Saturday! These are Beautiful and I love the little kitten. Visiting from The Patchwork Ark and Warm Heart Bears for Pink Saturday. All the creations you shared today are awesome. Trust you are feeling better by now. Just in time for sharing on a Pink Saturday! They are lovely! 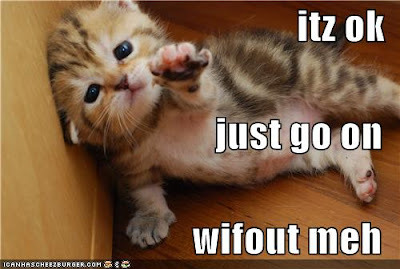 Thanks for the blog visit -Even though you said to go on without you (too cute) I am your newest follower. Happy Pink Saturday. Lorraine, every single one of these is charming but your brooch tops the charts! It's perfect. I do hope you feel a bit better soon -- seems to be the time of year for not being at our best. I hope you're lively and perky in no time at all! Lorraine, that brooch is GORGEOUS. I absolutely LOVE the way you pinned it to that tag. Oh my...love, love, love. Thank you for stopping by on Pink Sat. and a HPS to you too. Oh what beautiful journals your received. 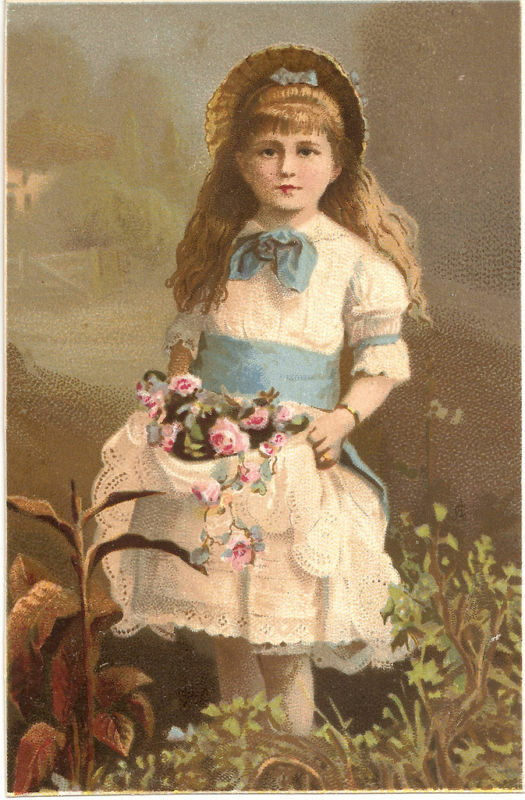 I love the little lady with a cloth embroidered dress, how elegant she looks. Her wings are so exquisite. The Cherish journal is just as beautiful. 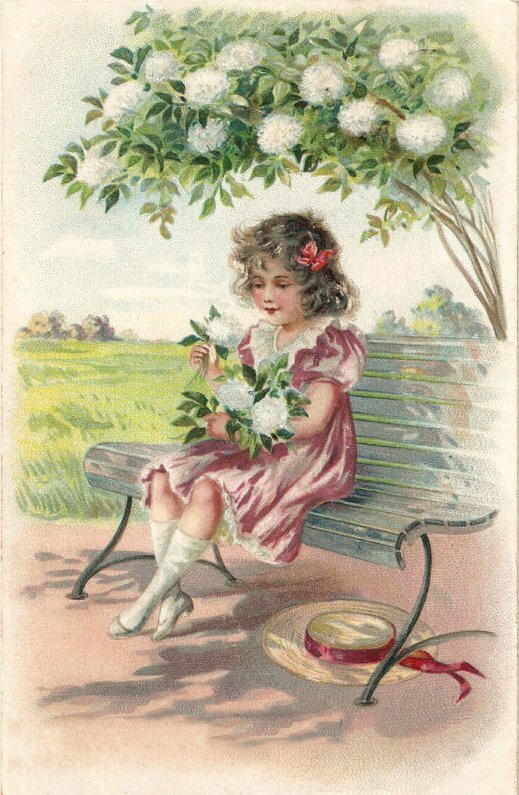 I love the little crowned girl and all of the feminine touches. Just priceless. What a beautiful job you did on your tag. It is so pretty. It is truly fit for a Queen dear friend. Another fabulous pink I've seen. Love it! Hi Lorraine - Visiting from Pink Saturday and was drawn in by Marie to visit you. Such beautiful work you do - and what incredible journals. I'm trying to move into this realm - but fear my own writing projects will take the time away from growing truly proficient in these marvelous collage mixed media works. Been collecting supplies for years with good intentions - but - little time to indulge. Such a lovely and inspiring visit with you, here - am following. Hope you'll stop by and visit me at The Writer's Reverie! 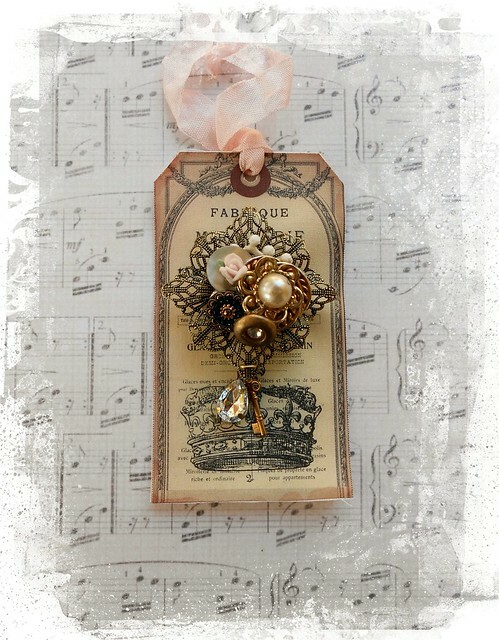 What a pretty brooch! I think it looks so fine on the tag! Here's a Hug for you! What lovely journal pages you have received! What a cute brooch you made! 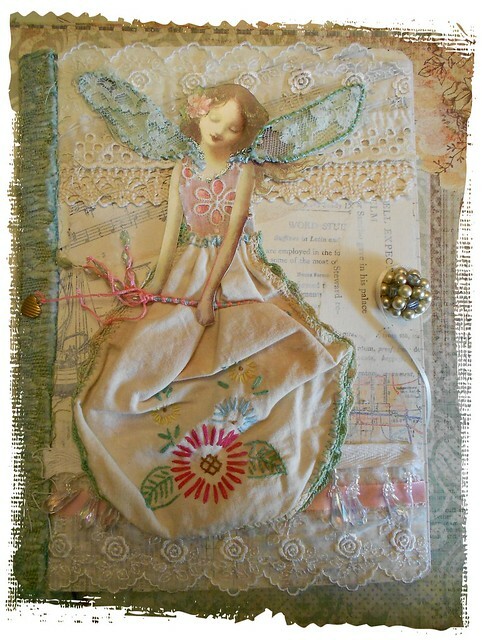 Happy Pink Saturday Lorraine, beautiful Journals you posted, one of my favorite items to create! Hugs Marilou Hope you are feeling better! Hope you're feeling better soon. Beautiful pieces. just found your wonderful blog thru white wednesday. now a follower. thx for the sweet images. These are such beautiful projects! Stop by and link up if you have time. How lovely. Those journals are really artistic. Gosh, these are beautiful, Lorraine! I've never tried my hand at this kind of art work...I certainly love seeing it. Very pretty!